Come and enjoy the peace and serenity of untouched Iluka. Walk down to the mighty Clarence River and through World Heritage Rainforests.The Iluka Motel has only nine, modern, clean and spacious units including Studio and Family Rooms. You will be charmed by our environment, a sleepy little seaside village. Enjoy our lush tranquil, tropical gardens, fountain and birdlife.Studio Rooms are very spacious with a queen and two single beds. Family Rooms have a separate bedroom, and in the lounge room two single beds.Enquire about longer stay discounts, SAVE from $20 a night, and Seniors benefits, because at Iluka Motel we reward Seniors with a reduced tariff and include a Complimentary Continental Breakfast for two (value $25.00). At Iluka Motel all rooms have en-suite, quiet reverse cycle air conditioning, dining table, cooking facilities, crockery, cutlery and microwave, flat screen TV's and DVDs, room service breakfasts, ceiling fans, private balcony or garden courtyard, front and back security screens, views to lush gardens and palms, all with off street and some under cover parking. Ample off street parking for boats and trailers.With an amazing undercover BBQ Gazebo area set in lush gardens, listen to the ocean, the birds and frogs.FREE Wireless Broadband, FREE Guest Laundry, FREE use of BBQ and Gazebo, FREE Foxtel.All of our units are 3.5 star AAA rated and we are near the main street, shops and restaurants, walking distance to the river, golf course, bowling club, pub and minutes from pristine beaches and rainforests. Walk to the ferry that takes you across the river to Yamba.The Riverview Apartment is located ABSOLUTE RIVERFRONT, some 500 metres from the Iluka Motel, is Iluka’s best 2 Bedroom Apartment. This developers custom built unit is in Iluka's Prestige Riverfront Units, “Riverview”. Located at the far end of the complex giving this unit the most privacy. 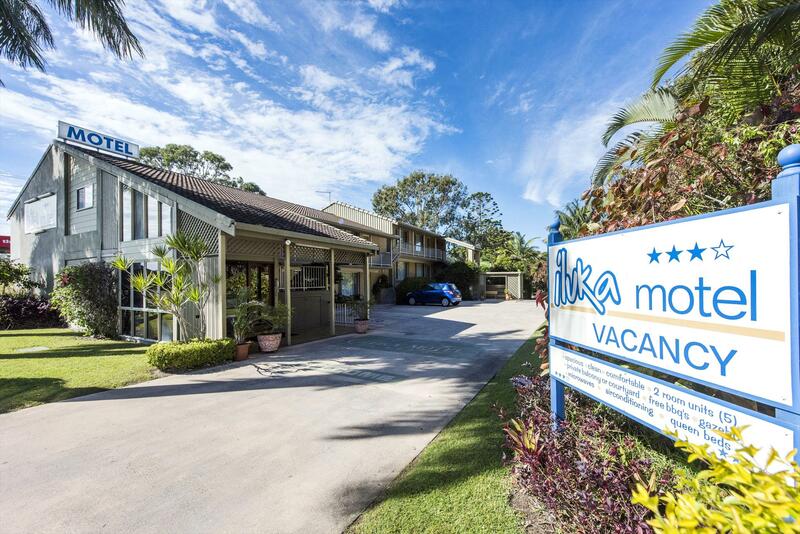 Large sunny Courtyard with magnificent river views.As hosts of the Iluka Motel, we are proud to have you stay with us. Our testimonials on our website speak for themselves.